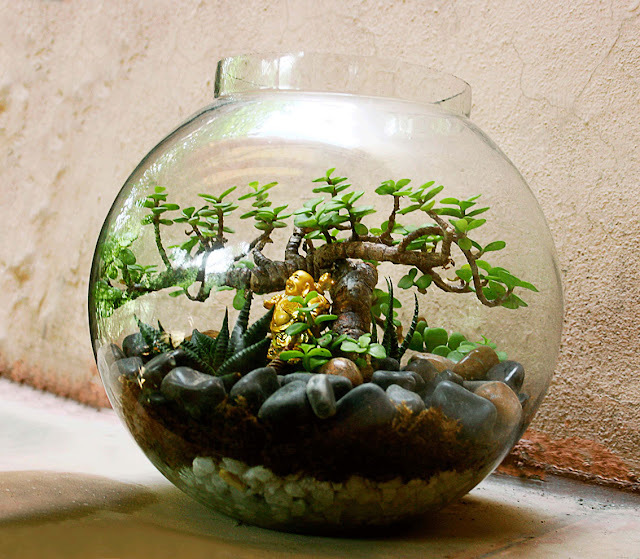 Terrarium best as decoration and good as educational material. 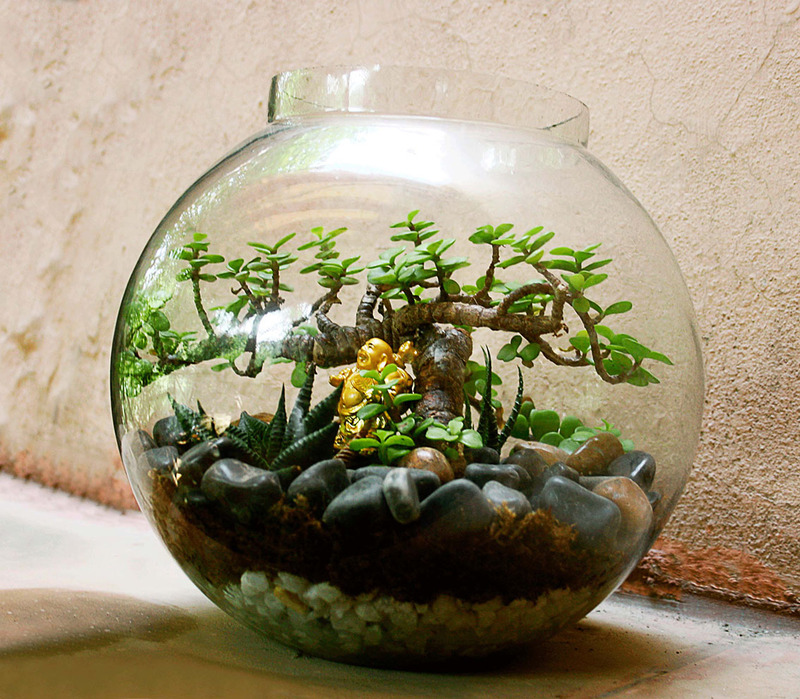 Terrarium usually made from small container (clear/glass materials) that will allow light get through it. The container can be open or closed and small opening to allow care for the plants grows inside it. Even though terrarium is very beautiful as ornamental it is also very important for education to understand more about plants growing process and behavior. Construction of the first terrarium is produced inadvertently by botanist Nathaniel Bagshaw Ward in 1842. He made observations of insects and the insects left the flask unattended. As a result, spores contained in the flask grow and produce terrarium. This later became a favorite at the time (Victorian Era) among the British people. But at first it was not known as terrarium but as 'Wardian Case'. This finding was used by Ward to send the plants from England to Australia by building a bigger 'Wardian Case'. Even after traveling for months at sea, the plants were found to be in good conditions. The same method was also used to bring plants from Australia (Sydney) to England (London). This method proves that plants can be stored in a sealed container without ventilation and are capable of living. Terrarium more popular for decoration. Closed terrarium provides moist environment for the plants in it. 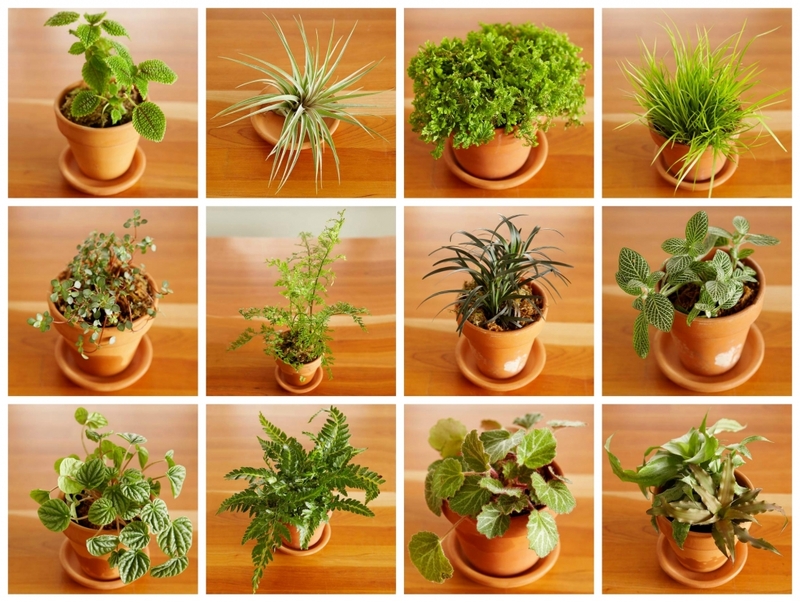 Among the plants that are suitable for terrarium. Even so, before you build your terrarium, there are few things that you need to pay attention. 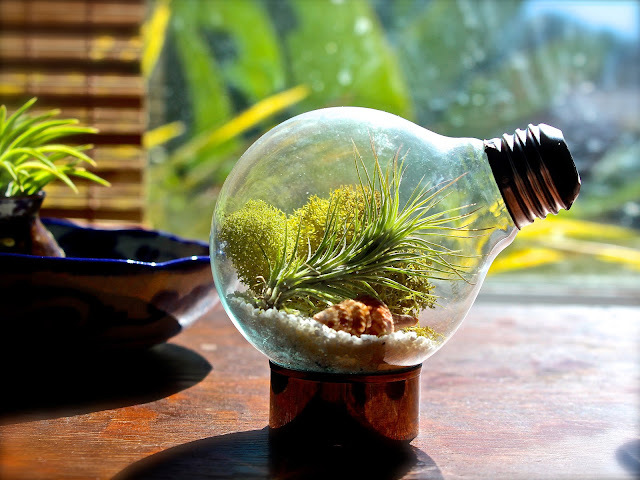 This because you need to think about a few important factors to allow the plant stored in your terrarium can produce enough cycle for itself to continue its life. In fact, several other factors should also be considered before producing the terrarium; container size, container type, species of plants, location of the terrarium, the amount of moisture, the plant material (soil, sand, stone, fiber, etc.) 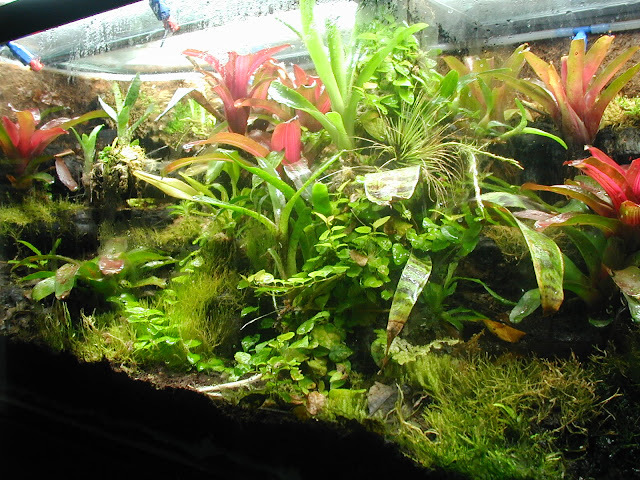 and the budget of the terrarium - if you planning is right, your terrarium may endure for a very long time. 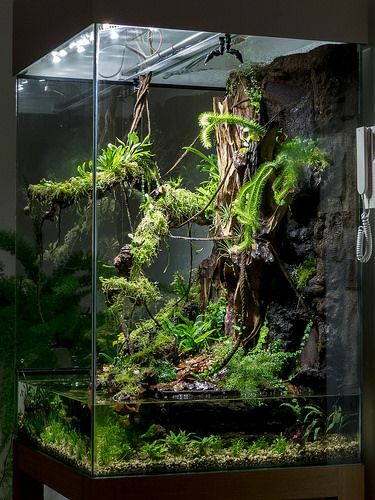 Closed terrarium suitable for indoor tropical plants like orchids, mosses, ferns and ‘air plants’ that need high moisture as in tropical forests. However for its care, it may have to be opened once a week to reduce excess moisture in the walls of the container, this also able to prevent the formation of fungus that can affect plants inside your terrarium. Terrarium should be watered when the soil moisture is decreasing (without the formation of water vapor on terrarium’s wall). The use of plant materials (medium) also carefully sorted to reduce infections in plants. 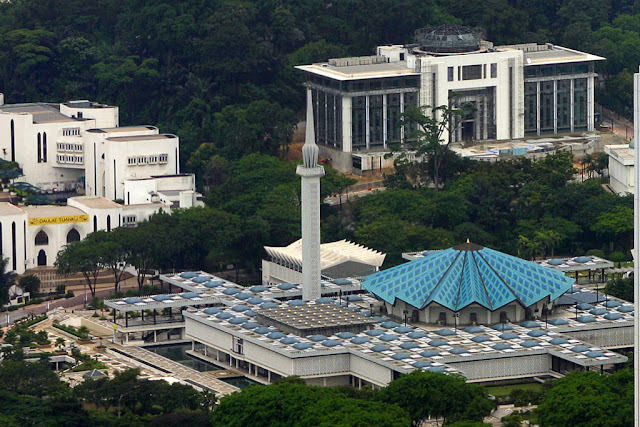 Appropriate plant material used is 'peat moss', 'vermiculite' and also 'perlite'. These materials should also be in "sterile" for killing micro-organisms that can cause infection. Terrarium provides a very good environment for these tropical plants. Terrarium for tropical and aquatic plants. Open terrarium is more suitable for water-storage plants (succulents) that are not suitable for damp and closed conditions like cacti and other dried plants. Open terrarium allows excess water vapor to be removed from the terrarium. 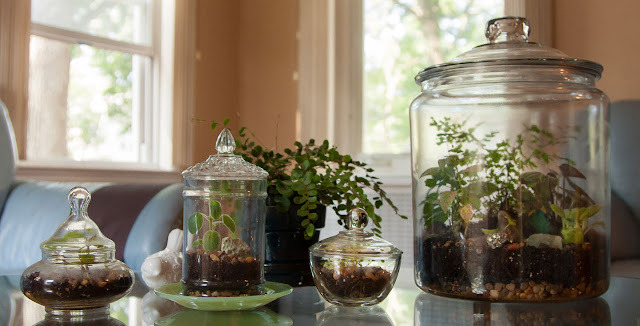 Another thing open terrarium also ideal for plants that require a lot of sunlight, where it avoids excessive heat from sunlight trapped in the container. Open terrarium easily maintained but at risk of infection. Terrarium with various sizes of plants in it. Terrarium not only beautiful as a decoration/ornament, but it also allows the growth of plants to be observed more closely. Cyclical process of moisture, air and water vapor in a closed terrarium indirectly describes the process air cycle in the earth's atmosphere and the importance of plants in that process. 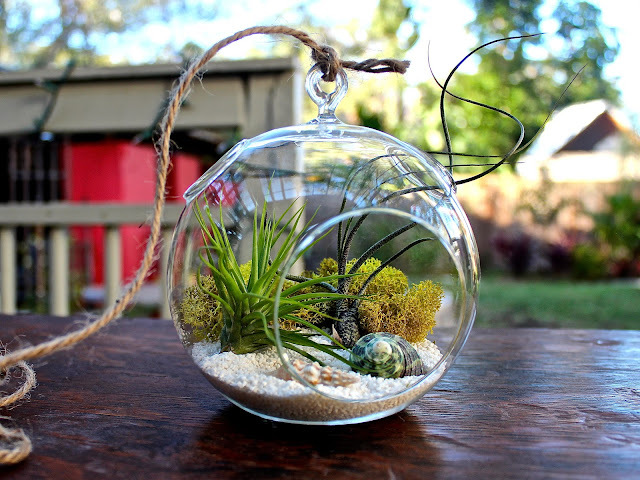 So if you are unable to make your own terrarium, maybe you can just buy it to get all of its benefits.